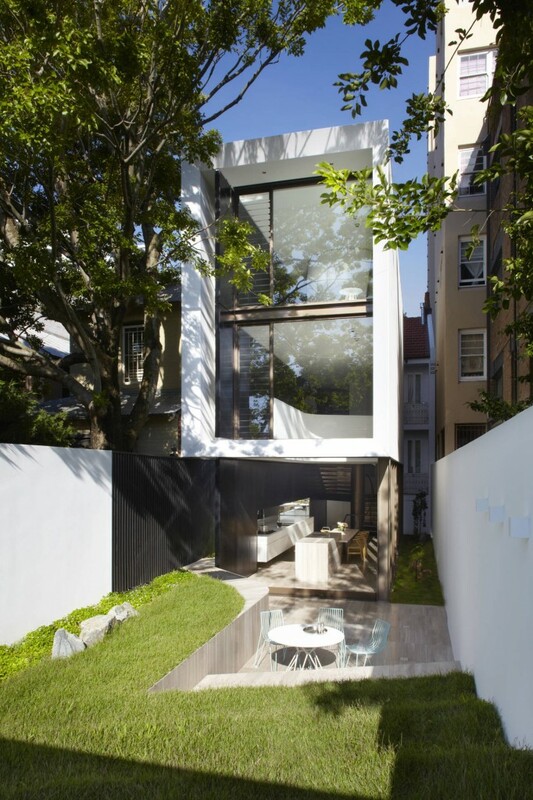 This project is a renovation and extension of an early 20th Century terrace house located in Pott Point Sydney. The owners, who had moved to Sydney from Hong Kong, asked the architect William mart of Smart Design Studio to create a variety of multi-use spaces, to suit their everyday needs as well as providing short term guest accommodation for constant visitors. 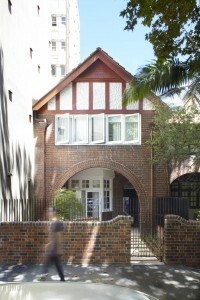 At the time the building was described as having a mishmash of rooms forming four separate apartments. 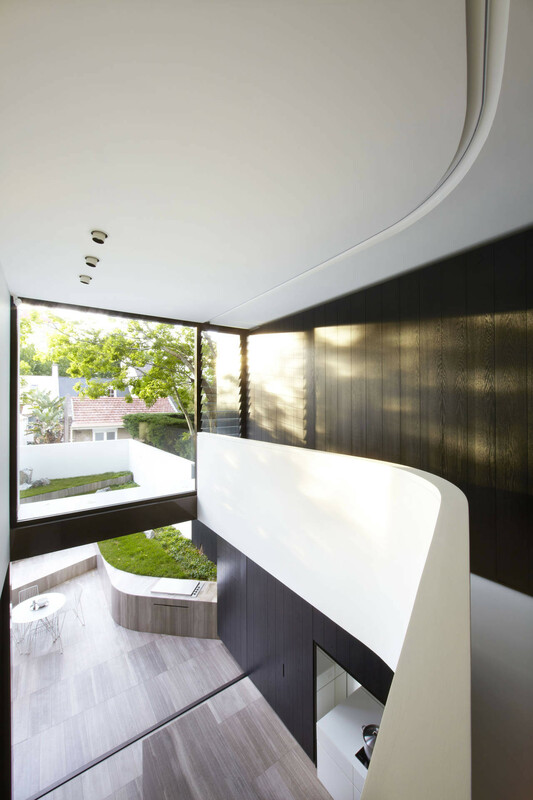 The brief was to create a streamlines cohesive whole; a modern, minimalist, oriental styled home, with a strong connection between indoor and outdoor spaces. 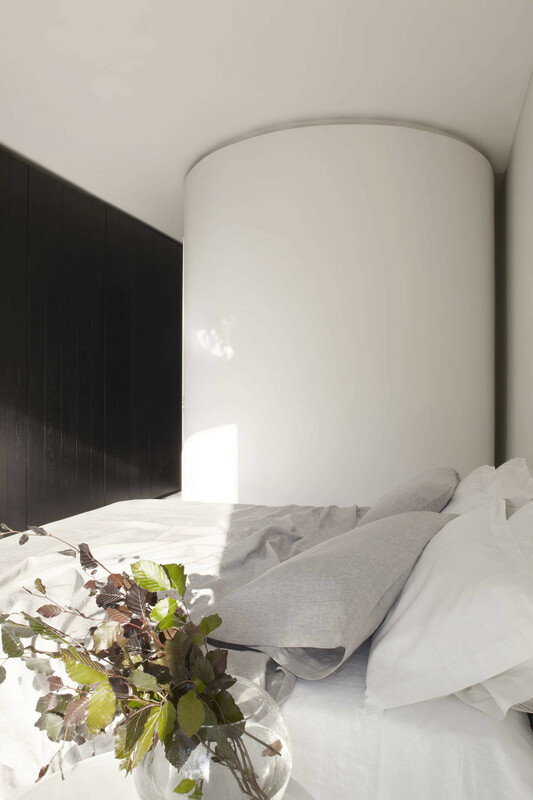 Smart’s response was to install a spiral staircase which provides the pivotal point where spaces interconnect and serves to separate the old and new parts of the house. The living areas and private zones occupy one area per level alternating between the old and the new section. The sculptural staircase spans the width of the building down six levels and features fan-like steel treads cantilevered from the central steel column. 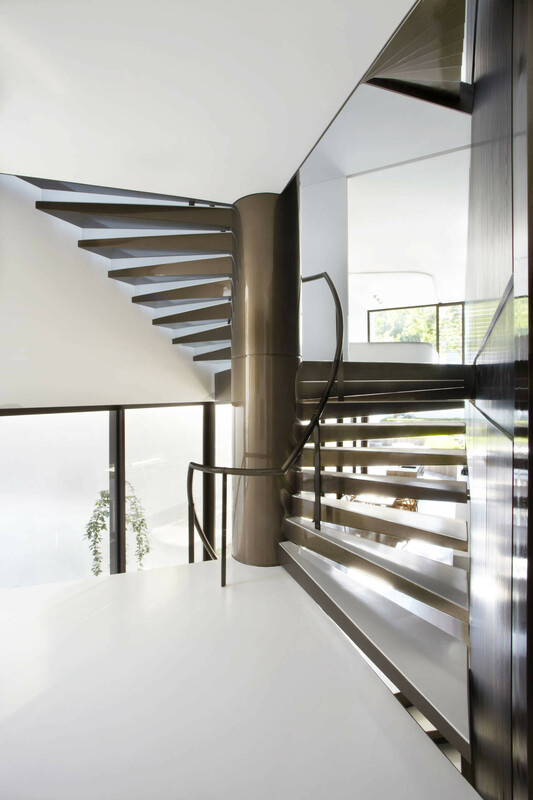 A high-gloss metal finish in a rusted burgundy colour has been used on both the column and handrail while the stairs are 16-millimetre steel, featuring mitred corners and white timber inserts. A narrow aperture of louvered glass that runs the full height of the building and at each landing the floor continues straight out from the stairs, flanked to the right by continuous cabinetry in black stained ash. The interiors of the old part of the house are of a more formal stripped-classical style and full of colour. 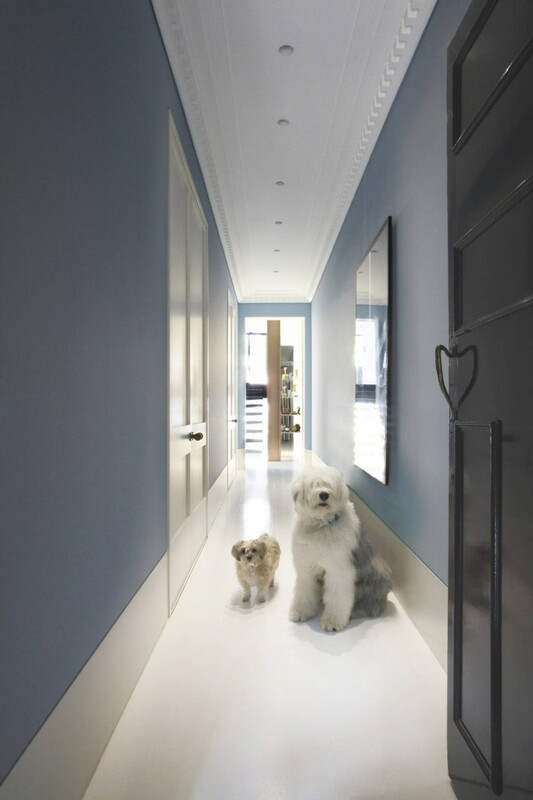 Deep flush skirting boards, paneled doors and wide blackbutt floorboards painted in a gloss white paint set off against richly coloured set plaster walls. The wide timber floorboards extend into the new section creating continuous flooring that works to connect the two halves. 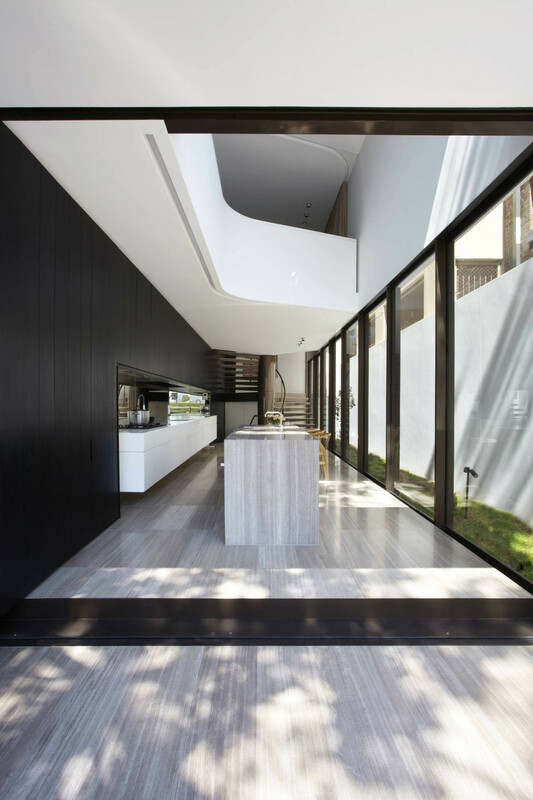 By way of contrast, the mainly white minimalist modern extension features a black stained timber-boarded joinery element across its three levels. Bronze window frames, ironmongery and trims also serve to unite the old and the new. Smart has introduced a number of cleverly designed concealed doors and openings, hiding away everything from a queen-size guest bed to a state-of-the-art music room, and garage door. For example, a section of wall cabinetry on the third floor exposes a narrow staircase when released. Once ascended, the stairs open to an attic room, which Smart has created as an all-white music studio. While not concealing this passage, the section of cabinetry sits snugly from floor to ceiling as a door to the master bedroom. A walk-in robe, a toilet and a bathroom have all been given their own rooms within the bedroom and are concealed behind cabinetry. Also on the third floor, but to the rear of the house, is the first of the guest rooms. This is, in fact, a suite comprising a lounging area, bathroom and bedroom. 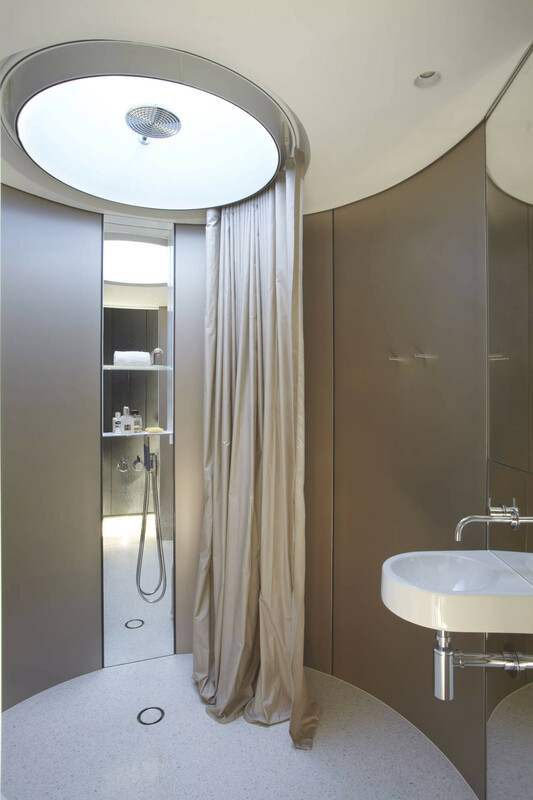 The bathroom fits within a floor to ceiling cylindrical form that is internally defined by a smaller circle of floor to ceiling curtaining and reflects the circularity of the stairwell. The guest bedroom itself has a large picture window which frames a nearby tree as well as letting in an abundance of natural light. Directly below this guest room is a study that is interactive with the lower floor, it includes an atrium defined by a short curving wall. Floor to ceiling curtains can be extended along the void for privacy. The cabinetry in this room opens to reveal a Murphy bed to accommodate additional guests. The kitchen and casual lounging area occupying the lower floor, boasts a grey Travertine floor and a long island bench of Corian in a similar finish. 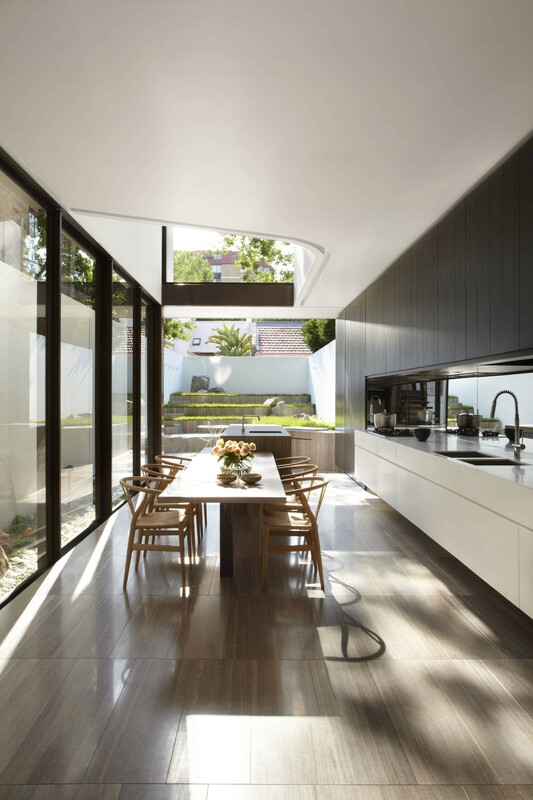 A connection to the outdoors is accentuated through a 13 metre clear span wall of sliding doors that overlooks a pocket garden which forms the garage roof. Once outside, a series of stepped rises function as seating, a barbecue and garden beds, the whole enclosed by a three-metre high solid wall. A section of the wall has a discreet keyhole and turns into a door leading to the car park concealed below the garden beds. A smart design, visually stunning but at the same time remarkably practical. Sources: Smart Design Studio website, Inside magazine 72: Homegrown, 'Order out of chaos as terrace remade' by Trisha Croaker, Domain, May 6, 2012.